The Professional Association of Innkeepers International (PAII) is now seeking nominations for the Premier Innkeeping Excellence (PIE) awards. Your thoughtful nomination will help PAII shine the spotlight on our hospitality industry's deserving individuals and businesses. For many years at the PAII Innkeeping Conference, members were recognized for their achievements in hospitality, innkeeping, service, and community involvement. We are so pleased to once again honor these industry stars! 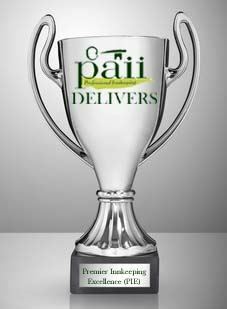 All PAII members are eligible to nominate the PAII member individual or company worthy of these prestigious awards – and don’t be shy - self nominations are welcomed. This year’s award winners will be honored at the 2018 PAII Innkeeping Conference & Trade Show in Orlando (January 7-9). Please tell us: have you told the nominee that you’ve submitted them, or is this ‘hush-hush’? Each category includes the specific criteria for the award; you’ll provide a detailed description on how your nominee excels and is deserving of the recognition. EMAIL your nomination to: kris@paii.org (Kris Ullmer, PAII Executive Director). This award honors a long-term PAII member who has shown continuous and extraordinary support of the industry and the association throughout their career. While a successful innkeeper, how has this individual has devoted energy and resources to advance the profession of hospitality and innkeeping as a career? This award recognizes a B&B Inn Innkeeper for their extraordinary hospitality and contributions to the B&B industry. The B&B Inn property of any vintage or size demonstrates architectural excellence and distinction. The Innkeeper serves as an ambassador for the B&B segment of the lodging industry, and has an integral role in promoting the local tourism economy. The nominee has advocated tenaciously on behalf of the 'level playing field' and other issues affecting the ability of B&B Inns to operate successfully. Nominees or applicants should describe any exceptional architectural features, unique history, exceptional guest relations, community involvement, tourism promotion activities, and innovations to be considered for this award. Hallmarks of this category are a high level of hospitality, and Innkeepers with abundant local involvement and knowledge. Whether on the local / state / national level, what specific successes have been accomplished with legislators and regulatory agencies?